Grab your handy food processor and toss in the 6 peeled garlic cloves. Blend until small pieces are sticking to the sides of the container. Add washed basil leaves picked from the stems, walnuts, salt, pepper, and olive oil. Blend and add olive oil if needed until mixture becomes a paste. Scoop out the mixture into a bowl and stir in the grated parmesan (optional). Serve mixed in with cooked pasta, smeared over pan-seared fish or shrimp, or spread inside a veggie pita. 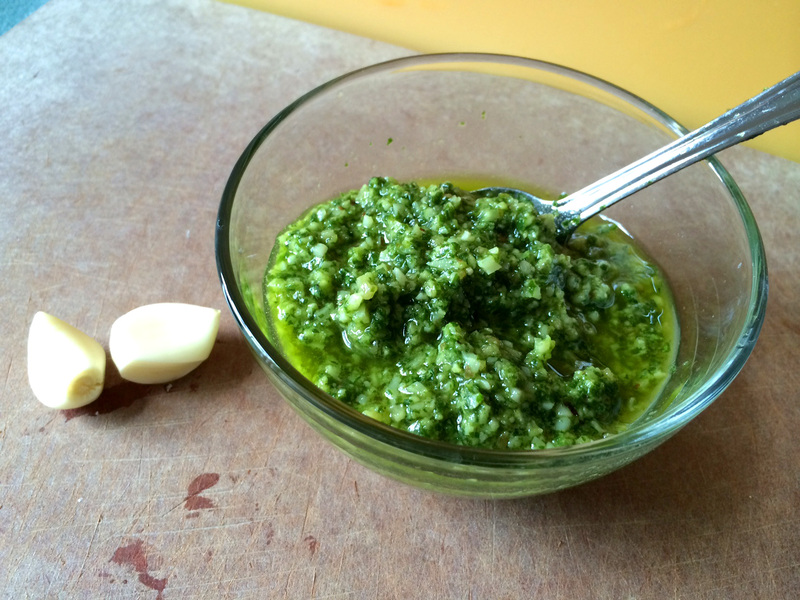 This is a delicious, nutty, aromatic pesto recipe that substitutes the traditional pine nuts with inexpensive and easy-to-find walnuts! It's incredibly versatile and can be stored in the freezer for later use.